To order a copy of the book, please contact us. The Buddha was born in ancient Eastern lands within India and Nepal over two millenia ago. And yet the compassionate teachings of this sage prince continue to resonate powerfully in the West today. The Buddha's Birthday Education Project invites you to explore the story of The Buddha. Starting with his legendary birth and selfless life, join the magnificent voyage of a legacy which spanned eras and crossed continents throughout history. Coming together in Humanistic Buddhism, we allow the Buddha's compassion and wisdom to shine a light of hope on humanity"
Sakyamuni Buddha was born in the human world, to teach human beings, and to help guide them to happiness. However in the past 2000 years since, traditional Buddhism has been tainted by beliefs that preached supersition. By recognising and returning to The Buddha's original intents of guiding the human world, his teachings are appropriately named " Humanistic Buddhism". 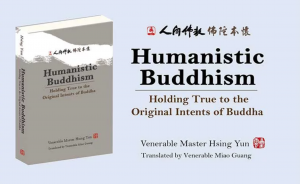 What is the essence of Humanistic Buddhism? Humanistic Buddhism is "what the Buddha taught, what is essential to human beings, what purifies and what is virtuous and beautiful". What are the core teachings and concepts of Humanistic Buddhism? The core teachings are found in the Threefold Trainings - discipline, concentration and wisdom. The core concepts are found within Dependent Origination and The Middle Path. What are the benefits of Humanistic Buddhism? Faith in Humanistic Buddhism shall lead to the purification of body and mind and freedom from attachment, delusion and affliction.